A passenger flying from Calgary to Saskatoon says she was left feeling "unsafe" and the target of stares and pitying comments after a WestJet agent outed her as a transgender woman to the other passengers on her flight. 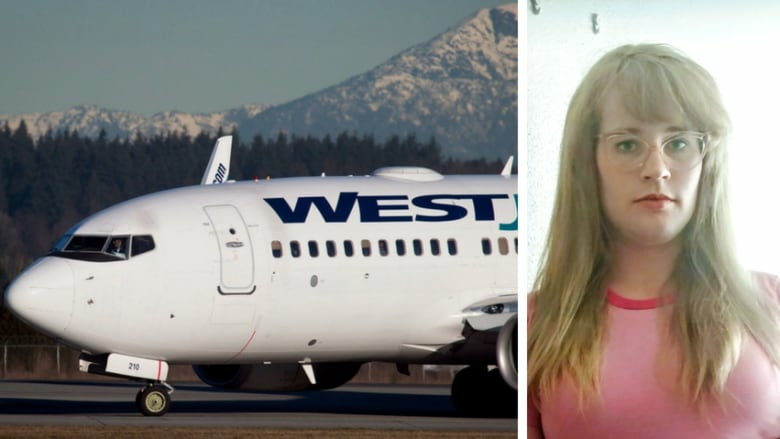 A passenger flying from Calgary to Saskatoon said she was left feeling "unsafe" and the target of stares and pitying comments after a WestJet agent outed her as a transgender woman to the other passengers on her flight. Lenore Herrem said the agent at the gate was "upset and confused" when she presented her ID and boarding pass for her flight home to visit her parents Wednesday evening. Herrem's gender presentation is female, but her gender on her Quebec health care card is marked as male. The accompanying five-year-old photo on the ID card is also presented as male. "She got upset and said, 'They don't match,' but her colleague said, 'Yes, they do, it's fine, go ahead,'" Herrem said as she described the agent's reaction. "So I gently and discreetly expressed to her, 'It's because I'm transgender, that's why they don't match up. But my face is the same and my ID matches the name on my boarding pass.'" Herrem boarded the plane and was settled in her seat for about 10 minutes when she said both gate agents boarded the flight, and the agent who had been confused once again demanded her ID. "She said something like, 'Oh, that's not the name I remember seeing on the computer when I looked at it,' and she started spouting off different, other women's names that were not mine," Herrem recalled. "She rolled her eyes at me and said, 'Are you sure it wasn't your girl name that was on the computer?' … She outed me in front of the whole airplane." Nothing like this has ever happened to Herrem before, and she said this was the first time she's ever had any issue with her ID. "I felt unsafe, vulnerable, belittled," she said. "I was in shock, it was quite traumatizing having someone, especially the way she did it so loudly and in front of everyone, it was really unprofessional." Outing a transgender person against their will can put them in a dangerous or threatening situation and can have significant impacts on their mental health, according to the Egale Canada Human Rights Trust website. The charity works to improve lives of people on the rainbow spectrum. Herrem said she often relies on "passing" as female, especially in unfamiliar places or when she's alone, to stay safe from harassment. "She took that away from me," she said. WestJet said in a statement that they have apologized to Herrem. "WestJet's inclusive culture is a point of pride for WestJetters and our goal has always been to create a safe and inclusive environment for all," the company said in an emailed statement. "We have extended our apologies to the guest and are reviewing the matter as we are continuously assessing and evolving our practices and policies to maximize inclusiveness and celebrate diversity." The company said their policy is in line with Transport Canada's regulations, which requires travellers to carry government-issued photo ID with a gender marker, as Herrem did. Herrem said a WestJet representative told her they will be doing an internal investigation. They also gave her a credit for the flight. "I was pleased with the way [the representative] did deal with it. She expressed that they will be implementing training to staff to deal with these sort of situations better in the future which was the most important thing for me to hear," she said.